There’s no question that the ability to watch movie through streaming has had a significant impact on the sales of physical media, like DVD’s. However, the belief that DVD or Blu-ray discs have all but gone the way of the Dodo due to video streaming services has proven to be a bit premature. In fact, recent studies have proven that approximately, 49% of all consumers exclusively purchase or rent movies on physical media, such as DVD’s. 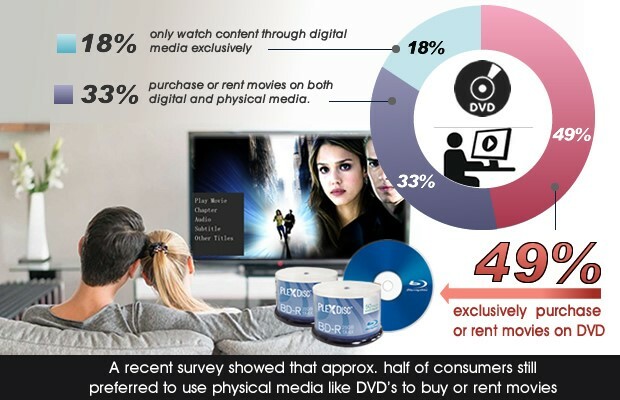 Another 33% of consumers, will purchase or rent movies on both digital and physical media. That means the amount of consumers that only watch content through digital media exclusively, is less than 18%. This number is certainly significant but we’re still a long way off before we can decry the death of physical media, which actually I don’t think will ever occur. The key is that consumers are still excited about and hold a very sizeable market for physical media. So, if you’re in the business of producing physical media, you should take solace that there will still be a sizeable market that needs to be serviced. Ultimately, I can see consumers regularly obtaining both physical and digital media, thereby creating a stable balance between the two. So if you service the optical disc market and you’re on the fence whether you should upgrade or replace older optical disc duplicators or scrap the whole project, I’m hear to say that your investment in the latest hardware with updated features would still be a wise investment with substantial returns well into the future. For more details about Vinpower’s line of standalone and automated duplication and publishing systems, visit www.vinpowerdigital.com or speak with a Vinpower representative today. Not only is an optical disc safer for archival storage, but it’s also cheaper to maintain as well. Often people don’t think about the costs associated with storing content in “The Cloud”, but over time it really adds up. 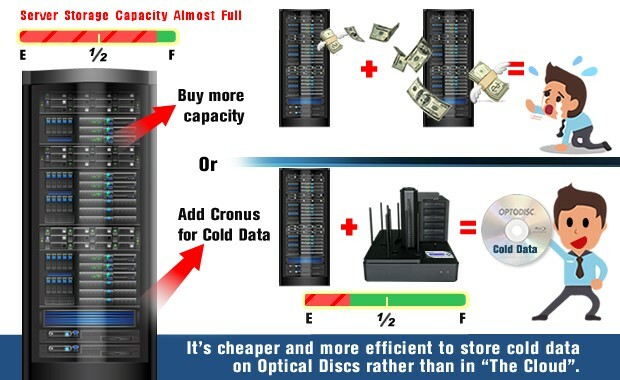 Outside of the initial cost for the disc itself, there are no residual costs associated with storing content on optical discs. It cost nothing to store an optical disc in a drawer for safe keeping, and when you need it, it can be loaded into a disc reader and view the content instantly. If you stored that content on “The Coud”, which is essentially just a server farm that a 3rd party controls, or even on your own servers, then there is a continuous cost that accumulates day after day, month after month, and year after year. Servers require a lot of electricity to operate and maintain the server, not to mention the tremendous costs for the air conditioning that maintains the server’s temperature and protects against overheating. It may appear as though The Cloud is free, once you go over the small allotment of “free” space, then many opt to pay a monthly or annual fee for greater storage capacity. It may seem fairly inexpensive in the short term, but rarely does anyone delete old content to make room for new content, so those fees just continue to accumulate and escalate. Once you calculate those fees over the long term, then you’ll see how these small fees can really add up and the more content you store the more the cost of maintaining it increases. Vinpower can help provide the hardware and media needed to easily copy the cold data onto archival quality optical discs. Thus, ensuring that the cold data would be safely stored and protected so that the content can be reviewed or extracted easily for many many years to come. For more details on any of the products that Vinpower carries, please visit our website at www.vinpowerdigital.com or speak with an official Vinpower representative near you. If you’ve already purchased the iXflash Lightning flash drive for your iPhone and/or iPad, we trust you have been very happy with the functionality and ease of use. However, Vinpower is never satisfied with the status quo and we are constantly challenging ourselves to make improvements and find ways to enhance the functionality of the iXflash APP. It is for that reason that we encourage our users to check for our updates on the Apple App store every 2 weeks or so to see if there is an update and to benefit from any improvements added at that time. The iXflash APP is what makes the iXflash the best option on the market when you’re looking for an Apple iPhone/iPad Lightning flash device. Not only is it very user friendly and intuitive, but it allows numerous other features besides just backing up photos from your phone. 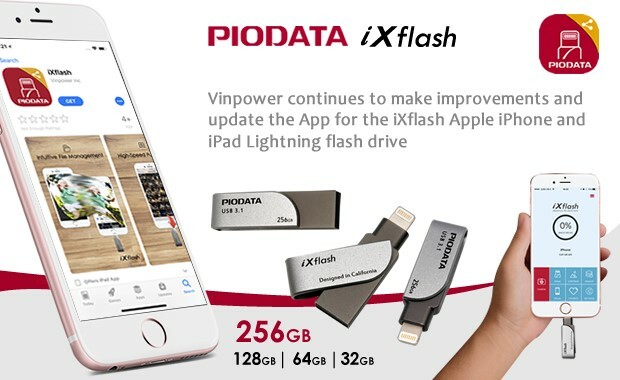 To get a better understanding about the abundance of features offered for the iXflash through it’s APP, view our website at https://www.piodata.com/ixflash.html, or speak with a Vinpower representative today. 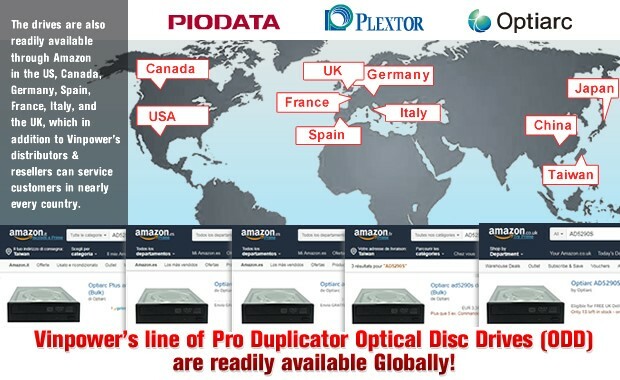 Vinpower’s line of Pro Duplicator Optical Disc Drives (ODD) are readily available Globally! Now that fewer personal computers come standard with optical disc drives (ODD), there are fewer and fewer manufacturers producing them. The ODD manufacturers that remain are putting less resources into maintaining the drives and are actively trying to cost down on the components used to build those drives. These factors inevitably lead to lower quality drives with a shorter life span. That’s why Vinpower has worked diligently over the years to provide our own lines of professional series Half Height Optical Disc Drives, featuring the Plextor, Optiarc, and Piodata series. Each of these drives were developed to have greater compatibility, reliability, and longevity, compared to the standard off the shelf ODD’s currently on the market. These drives are perfect for building your own duplicators, replacing drives on older systems, such as manual towers, autoloaders, and publishing systems, regardless of the manufacturer, and for use with computers and high scale servers. Now that you know these drives exist and would be the perfect solution for your needs, the next question is inevitably where can I find them to purchase? Fortunately, these drives are readily available in most countries around the world. They are available in North and South America, throughout Europe and Asia, including Australia. The drives are also readily available through Amazon in the US, Canada, Germany, Spain, France, Italy, and the UK, which in addition to Vinpower’s distributors & resellers can service customers in nearly every country. Don’t settle for subpar drives that may look cheaper, but end up costing you far more money in the long run due to shorter lifespan and inconsistencies in the burn quality, which create numerous bad burns. Instead, you can easily and quickly order any one of Vinpower’s professional line of ODD to ensure the job will get done right the first time without downtime for a defective or overheated drive. For more details about this product or any of Vinpower Digital’s range of hardware, software, and media offerings, visit our website, www.vinpowerdigital.com, or speak with an authorized Vinpower representative near you. Living in California, there have been a number of major fires in multiple locations throughout the state. This seems to be a horrible recurring theme in the state due to extremely hot and dry weather. When I think about what I would want to take with me, after making sure my family is safe, my first thought it to protecting the items that are the most irreplaceable. These are items that if lost can often never be replaced, such as photographs, videos, and mementos that represent a person’s life and the lives of those they care about. If those items are merely kept as standard pictures, film, or even stored on a hard drive, natural elements like fire, water, and mud can completely destroy them. However, optical discs are more durable and can withstand being submerged in water or covered in mud, even extreme heat if stored in a safe place. So, if you are able to store all digital images and content onto optical discs, there’s a greater chance they will still endure should a disaster strike. Just like you shouldn’t keep all your eggs in one basket, it’s always wise to keep the most important content stored on multiple sources; possibly in the cloud and on 1 or more hard drives, but for the most protection. I would strongly suggest that at least one of your safety nets remain optical discs. Hopefully, most of us may never experience a major catastrophe, but there are still small isolated incidents like a house fire, burglary, computer virus, or any number of incidents that could cause you to lose mementos and content that you could never replace. That’s why it’s so critical that you have adequate back-ups. We at Vinpower hope you will take the time to safeguard your treasures and back them up on optical discs. For more information about any Vinpower products, please visit our website, www.vinpowerdigital.com, or contact a representative near you.